Welcome to a cleaner tomorrow. Between its ambitious plan to guarantee all citizens internet access, forward-thinking universal basic income (UBI) program, and huge investment in developing artificial intelligence (AI) technology, Canada is quickly emerging as a global leader in innovation. The latest evidence? The country’s clear commitment to clean energy. 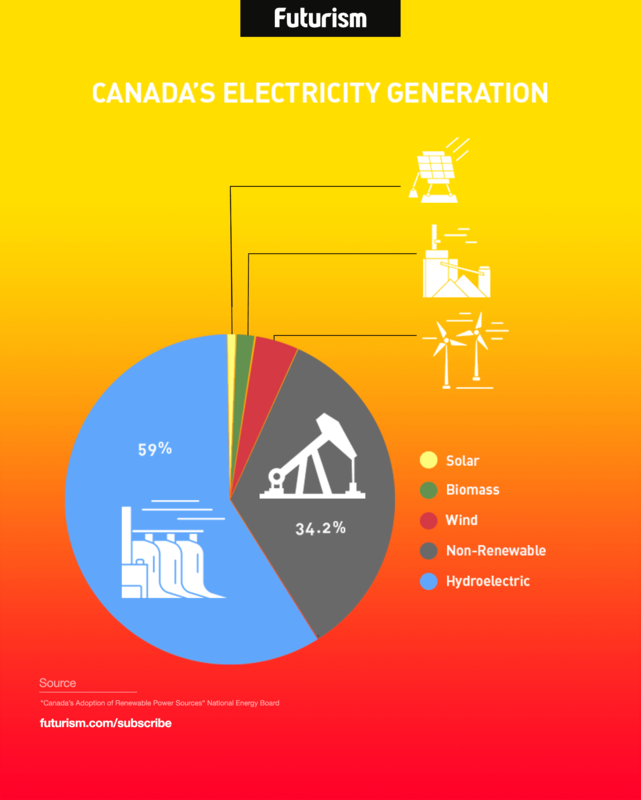 According to a new report from the National Energy Board (NEB), in 2015, 66 percent of Canada’s energy was generated by renewable sources. Fifty-nine percent of that energy was created with hydro, making the country responsible for 10 percent of all hydro-electricity produced worldwide. The other 41 percent of this energy was generated through a combination of wind, solar, and biomass, and Shelley Milutinovic, chief economist at the NEB, thinks that those sources are on the rise. “Now, as solar, wind and other technologies become more cost competitive, we expect to see a continuing increase in their adoption in the future,” she told The Independent. Just last month, the Earth hit another milestone in atmospheric carbon dioxide levels, and organisms across the planet are dying, some to the point of extinction, due to the effects of manmade climate change. Evidence of our devastating impact on this world is getting clearer every day, and if we don’t dramatically change our ways, experts warn that humanity is on its own path to extinction. At the core of this problem are fossil fuels. But, thanks to Canada and those who share the country’s vision of the future, the fossil fuel industry is on the decline. Global superpowers are holding each other accountable through international initiatives like the Paris Agreement, major companies are eschewing coal in favor of clean energy alternatives, and drivers are trading in their gas-guzzling cars for increasingly affordable electric vehicles. As Canada and others lead the way, this increased adoption of renewable energy will go a long way to halting, and perhaps even reversing, some of the damage that’s already been done to the planet we call home — at least for now.